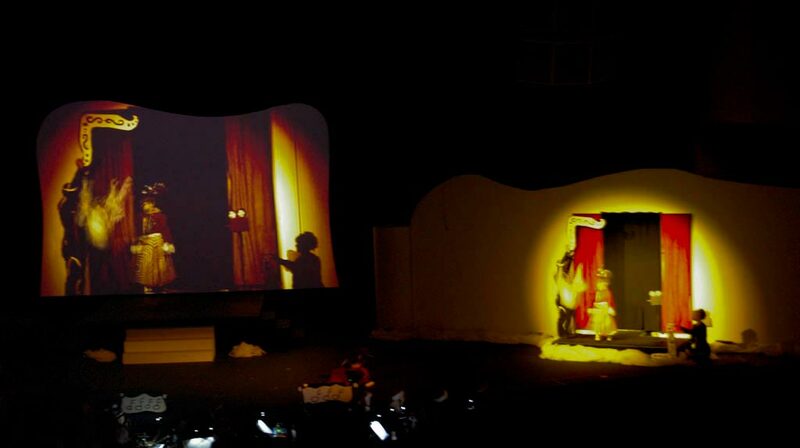 One of my favorite technical achievements from our production of Gunch were the Silent Film scenes. These three scenes were written to fill in the back story of Gunch and give the audience a glimpse into the current predicament the U’s found themselves in. As the scenes depicted in the films were set many years ago, we wanted them to look old, like the silent films of the ‘20s. To create that effect, we used a number of technical tricks. But first, the set up. The silent films took place on stage left in front of our 36’ long wall. We fashioned doors in the wall that opened up to allow the actors access to a 4x8 piece of SteelDeck. Creating the look we wanted was a team effort between costuming, lighting, video and the band. All the costumes for the silent film actors were black and white (and technically, grey). We lit the stage with two of the Mac 700s we had hanging in the house. The Macs were dialed into a sepia-colored wash and had a de-focused animation wheel running to create a flickering effect. Our music director whipped up some old-timey music on his synth that sounded remarkably authentic. And for good measure, we ran a old film projector sound effect in the background to round out the ambiance. All of that was in place to set up the video. You see, we had a 22x18 screen upstage center that was the primary target for the silent films. We wanted people to watch the big screen during the films, but we also wanted the actors to be acting live. Our goal was that people would watch the “film,” and never really notice that the action was taking place just to the right. The effect worked; several people thought we had filmed the films and the actors were just mimicking it. Others never noticed the actors. To create the old film look, we got creative with our video chain. We locked down our Hitachi Z-4000W camera on the silent film stage. Because the lighting levels were low, we gained up to about 12 dB. We took the analog component output of the CCU into our ProPresenter MacPro using a BlackMagic Intensity Pro card. At this point, it gets fun. Though we could have run the Intensity card straight into ProPresenter as a live video input, we wanted some effects first. So we routed the camera signal to CamTwist first. The "Webcam" at the top of the third column is simply the selector for the video input. In a pop-up on the fourth column, we selected the Intensity Card.CamTwist allows you to take a video input (or screen area, another very great use for CamTwist), do some manipulation of it if you desire then create a video “output” that other apps can use. In our case, took the video from the Intensity card, applied QuickTime filters Black & White, Sepia and Old Movie to it and sent it out. ProPresenter sees CamTwist as a video input and voilá, very cool, old time video on the screen. Since we had to run a series of title slides intermixed with the video, we created the titles in FinalCut Pro using the same filters. Back in ProPresenter, we simply created a series of slides that alternated between a full-screen video input and the title videos. At the end of the day, the effect was terrific. Early tests indicated that it would look pretty good, but the final result was great. The combination of signal processing, high gain on the camera and distortion from projecting on the large wall created a visual that really did look like an old film.